Methylnatrexone has hit the big time with a very timely publication of a industry funded double-blinded RCT in the New England Journal of Medicine. If you have been in palliative care for the past few years, methylnatrexone has been one of the drugs with some 'buzz' around it at conferences and in publications. We have touched on MNTX a few times here at Pallimed before. The participants were already on stable opioid doses, and stable laxative regimens with less then 3 reported BM's in the past week. More than 50% rated their 'constipation related distress' as moderate to severe. This seems to be a somewhat broad inclusion criteria. Constipation can be a very distressing symptom, but there are two types of distress from constipation: psychological distress of not 'being regular' and physical distress from GI discomfort. Many patients with advanced illness may have decreased number of stools for many reasons besides just opioid constipation, and I would propose that a regular number of stools for those with anorexia-cachexia syndrome and decreased functional status may be less then 3 per week. In assessing constipation related distress, managing expectations is part of good clinical care. Interestingly less then 30% were on stool softeners, but most were on 2 laxatives of some category (stool softener, enema, bulk producer, contact laxative, or osmotic agent). I thought the percentage would be much higher in this population. Of interest to some will be the oral morphine equivalent doses (OMED) these patients were on. I always find this interesting when seeing studies about hospice and palliative care patients, because opioids have a wide range of therapeutic dosing. The mean OMED was 339mg (+/-1214 )(placebo) and 417mg(+/-787)(MNTX) with a wide range in the study (9-10,160mg of morphine equivalents per day). For those readers who have not worked in palliative care you did read that number right. 10,160mg of morphine equivalents per day. If you ask anyone in palliative care they will probably tell you about the one or two patients they have seen up in that range. Now that would be a case-series to figure out how someone is tolerating those doses. BTW the logo is pretty bland too. Come on now another circular logo? Are they trying to replicate the millions of hospice logos with 'embracing circles/hugs?' I would think something coming out of something else would be more representative. Any graphic designers or wordsmiths want to help Wyeth out? I am sure many in palliative care are glad this medication is available and we will probably go through the next few months trying to figure out where it fits in the bowel toolbox. Thomas and the rest of the authors (and Progenics) should be commended for a well-designed research study in a hospice-oriented patient population. It would be a good article to review in a journal club to see how the study was designed and carried out, especially with so many institutions. Overall the study is a good one, but it should be noted it was industry funded, which is notably very transparent in the article: "Progenics Pharmaceuticals designed the protocol and collected and analyzed the data." Is this part of the beginning of more pharmaceutical industry-palliative care/hospice collaborations? I would be interested to hear from Pallimed readers about their thoughts on the field's collaboration with industry. Is this a new source for funding and advancement of our field? Or is this a 'bogeyman' that is relatively absent from our small but growing field? Of note there are two good editorials (here and here - sub required) in the issue regarding opioids and constipation. Thomas, J., Karver, S., Cooney, G.A., Chamberlin, B.H., Watt, C.K., Slatkin, N., Stambler, N., Kremer, A., Israel, R. (2008). Methylnaltrexone for Opioid-Induced Constipation in Advanced Illness. New England Journal of Medicine, 358(22), 2232-2343. Most people with any access to any media probably could not escape the story about Ted Kennedy's seizure and eventual diagnosis with a glioblastoma these past few days. The very public disclosure of a diagnosis in a public figure deflates any presumption of 'keeping information' from the patient which is an occasional conflict in medical care. Imagine as a non-public figure you did not want to hear a lot of information about your diagnosis or prognosis and you try to escape by watching some TV. Flip on the TV and on CNN you get Sanjay Gupta telling you everything you did not want to hear. Of course any illness in significant celebrity can be a 'teachable moment' as we have seen with Randy Pausch and pancreatic cancer, Elizabeth Edwards & Betty Ford and breast cancer, Ronald Reagan and Alzheimer's dementia, Magic Johnson and HIV, Katie Couric's husband and colonoscopies, Art Buchwald and hospice, and so on. (I wonder if palliative care will ever have a celebrity champion?) This public disclosure of an illness can provide a focus for patients and families going through the same situation, but it also can bring out lots of misleading information about 'miracle cures' without any demonstrated efficacy beyond anecdote. Events like this also make such unfortunate things like celebrity death pools come to light. A particular influence in this situation is "survivor bias", in which the people who will likely call into the radio shows or write letters to the editors are alive. The survivors of often fatal illnesses therefore skew the perceived bias of survival. Dead people don't have that ability and families may not have as much incentive to write/call in and say, "My husband had a brain tumor and died 1 month after being diagnosed." Hopefully the media will strive to keep this balance right. Dr. Barron H. Lerner wrote a book that sounds like it strikes the right balance called When Illness Goes Public: Celebrity Patients and How We Look at Medicine. He spoke on NPR this week and counterbalanced some callers with skilled firm diplomacy. A curious and morbid observation in discussing the medical care of public figures is the focus on prognostication which conversely is commonly avoided or glossed over for 'non-public figures' with life-threatening illness. The LA Times ("Kennedy's tumor prognosis is weakened by age") and my local Kansas City Star ("A grim prognosis for Kennedy") had articles discussing general information about glioblastomas, and both focused on prognosis in the title and the article. How does knowledge of a public figure's prognosis affect us as citizens? Maybe we are treating that person as part of our own circle of family and friends since we have seen them in our lives more than some of our family or friends. In some talks on prognosis, I covered prognosis of survival in glioblastomas with the help of my colleague Mike Salacz. Here is one of the slides from that talk with references at the end. 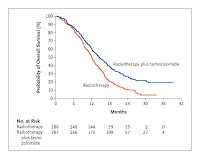 As you can see temozolamide plus radiation improved survival, but the real point of this slide is that it really depends on what study you are looking at to base your prognosis. Understanding the selection criteria for these studies to see if it matches your patient is important. The NEJM has a free pdf of a 2005 review article of treating giloblastomas with radiation and temozolamide. The Kaplan-Meier survival curve is what I find most helpful in understanding disease progression (click picture for NEJM site view - free registration). The curves get steepest in the 6-12 month range which is also where you cross the median. That information together helps paint a likely picture for patients and families to prepare for if no other significant co-morbidities exist. But this is still a serious illness that requires plenty of planning (advance directives, living will, financial planning) and focus for how the next 6-12 months might be. Stupp R et al. Radiotherapy plus concomitant and adjuvant temozolomide for glioblastoma. N Engl J Med. 2005 Mar 10;352(10):987-96. Athanassiou H et al. 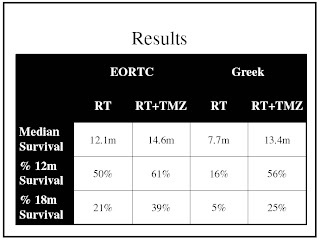 Randomized phase II study of temozolomide and radiotherapy compared with radiotherapy alone in newly diagnosed glioblastoma multiforme.J Clin Oncol. 2005 Apr 1;23(10):2372-7. Mirimanoff RO et al. Radiotherapy and temozolomide for newly diagnosed glioblastoma: recursive partitioning analysis of the EORTC 26981/22981- NCIC CE3 phase III randomized trial. J Clin Oncol. 2006 Jun 1;24(16):2563-9. Gaspar L et al. Recursive partitioning analysis (RPA) of prognostic factors in three Radiation Therapy Oncology Group (RTOG) brain metastases trials. Int J Radiat Oncol Biol Phys. 1997 Mar 1;37(4):745-51. As Drew alluded to in the last post before his all expenses paid by Pallimed paternity leave, we have some exciting new content to bring to you. We are proud to announce two new companion blogs to Pallimed! Pallimed: Arts & Humanities (arts.pallimed.org) is a new blog focusing more in-depth on the many themes in palliative medicine that intersect with film, music, paintings, books, and other artistic media. Pallimed: Arts & Humanities will be a weekly blog hosted by Amber Wollesen, MD and Amy Clarkson, MD with contributions from the stable of Pallimed authors. The first post on the top 10 palliative care films is up now. Go on over, comment on what movies should have been on the list, and sign up for an email or RSS subscription (free!). To make it easier to move between the blogs, a new navigation bar has been added below the main header. The blogs are color coded: Blue=Cases, Green = the Main Blog, Red = Arts. The main blog at www.pallimed.org will continue to post about 2-3 times per week. We decided to split the blogs so we could still bring you the original content from Pallimed without increasing the total posts or diluting the content. Thanks very much for your readership! Please let your peers and colleagues know about the new additions. This will likely be my last post for a while as my 2nd boy is due to be born in a few days. I'll be back in time however to mark the beginning of Pallimed's 4th year in the 2nd half of June. Yikes. Christian has been working overtime on an up & coming expansion of the Pallimed 'family' too, which he will likely be announced while I'm away, & I just wanted to take this moment to acknowledge Christian's efforts and vision. NEJM has a perspective piece on 'etiquette based medicine' (free full-text available). It's a brief article about teaching bedside manners & etiquette and engages in a discussion of whether it's better to encourage doctors to be more 'humane' and compassionate or, simply, to be polite and attentive. I think this is a very reasonable proposal and is often what I teach trainees. I'd love it if all doctors were genuinely empathetic and compassionate, and cared about their patients' suffering and lived-experience of their illness. However, you can do that and not have good bedside manner, and, as I opined on the blog earlier, having too much (or the wrong kind) of emotional response to our patients' suffering does not necessarily make one a better physician or help our patients. Training for an etiquette-based approach to patient care would complement, rather than replace, efforts to train physicians to be more humane. Pedagogically, an argument could be made for etiquette-based medicine to take priority over compassion-based medicine. The finer points of patient care should be built on a base of good manners. Beginning pianists don't take courses in musicianship and artistic sensibility; they learn how to have proper posture at the piano and how to play scales and are expected to develop those higher-level skills through a lifetime of study and practice. I may or may not be able to teach students or residents to be curious about the world, to see things through the patient's eyes, or to tolerate suffering. I think I can, however, train them to shake a patient's hand, sit down during a conversation, and pay attention. Such behavior provides the necessary — if not always sufficient — foundation for the patient to have a satisfying experience. On a related note BMJ published a randomized controlled trial of the placebo-effect. (I love the cover they created for this issue.) It involved ~260 patients with irritable bowel syndrome who were randomized to observation (a waiting list), sham acupuncture performed in a cold, perfunctory way (the practitioners would tell the patient that this was a scientific study and that they weren't to talk with the patients), or sham acupuncture performed by practitioners who were deliberately kind, caring, warm, etc. As you'd expect, everyone's symptoms improved but did so in a step-wise manner (which the authors somewhat cheekily describe as a dose-response curve of the placebo effect): cold sham acupuncture did better than observation and warm/friendly sham acupuncture did best of all. Their intentions with the study were to delineate and measure different potential components of the placebo effect (e.g. the effect of a sham procedure vs. the effect of interactions with warm, caring clinicians - it would have made an even more interesting study if they had had a caring practitioner-only arm) - and while that's an interesting topic what's more interesting to me is the observation that the bed-side manner of the clinicians improved the subjects' symptoms. This is of course not at all surprising but, heck, what's wrong with a little 'data' to back up our claims that warmth, listening, etc. are therapeutic in and of themselves. One also wonders if it's appropriate to even call this the placebo-effect (which, accurate or not, has a connotation that it's from a patient's mind being 'tricked' into a therapeutic response) as opposed to something else (a 'therapeutic demeanor,' 'therapeutic listening' etc. etc.). That this study chose to evaluate placebo effects associated with an unconventional treatment raises further interesting questions. It is already widely assumed by sceptics that most if not all of the benefit of "alternative" or integrative medicine comes from the placebo effect. It is then assumed that demonstration of a powerful placebo effect, without proving a specific effect, is enough to consign the treatment to the realm of quackery. But what if we asked a different question? Is it possible that the alternative medical community has tended historically to understand something important about the experience of illness and the ritual of doctor-patient interactions that the rest of medicine might do well to hear? Many people may be drawn to alternative practitioners because of the holistic concern for their wellbeing they are likely to experience, and many may also experience appreciable placebo responses. Why shouldn’t we try to understand what alternative practitioners know and do, as this may help explain why so many patients are prepared to pay to be treated by them, even when many of the treatments are unproven? Critical Care Medicine has a paper looking at the appropriateness of using data from chart reviews to determine the quality of care of the dying in an ICU (whether certain data gleanable from a chart review can reliably predict quality of death). JCO has a validation study of a prognostic model for colorectal cancer which includes WBC count, alkaline phosphatase, and patient self-reported social functioning. JCO also has a systematic review of the treatment of dyspnea in 'terminally ill' cancer patients. The most interesting aspect of it, for me, was its review of trials for non-pharmacologic measures, most of which were nursing psychosocial and educational interventions (they seemed to work). Acupuncture didn't seem to work, but perhaps the practitioners' bed-side manner wasn't that good. Annals of Internal Medicine has a narrative review of office buprenorphine for treating opioid-dependence. JAMA has a clinical review about chronic low back pain. A reasonable addition to the teaching file. Mentions opioids and the controversies about their role for CLBP. Supportive Care in Cancer has a case series looking at the natural history of patients who receive implanted peritoneal drainage catheters for malignant ascites. This is certainly a well-described practice, but this is the first study that I've seen which tries to measure how a group of these patients fared after catheter placement (which was OK - mean survival was 39 days which is not surprising given that they had refractory malignant ascites; relatively few complications from the catheter; and the majority of patients reported benefit from catheter placement). Journal of Pain has a rat study looking at oxycodone plus ultra-low-dose naltrexone & the pathophysiology of neuropathic pain and hyperalgesia. Not that this study is practice changing but it's part of a growing body of mostly pre-clinical data about the possible analgesic benefits of opioid receptor antagonists (like naloxone and naltrexone) which I find interesting and am impatient for some human studies (case reports like this one are tantalizing - I'm very curious if anyone actually has any clinical experience with this). J Pain also has a placebo controlled trial of marijuana cigarettes for neuropathic pain. Somewhat helpful, but 'neuropsychiatric' side effects (aka 'feeling stoned') were significant. Second, good death is subjectively determined and, therefore, attempts to ascertain the objective "truth" of the end-of-life experience may be futile. We must, instead, acknowledge and accept the subjectivity inherent in all accounts, whether provided by patients, family, or health care professionals, and determine how to make use of these multiple perspectives. More research is needed to understand factors that influence end-of-life preferences and experiences, including sociodemographic factors, individual psychology, religious and cultural background, and social and health care context. Third, emphasis on good death could lead to ways of dying being normalized or pathologized. Both commonality and diversity of opinion were identified in the reviewed studies, which justifies caution regarding the assumption that there is a singular good death. Because a good death may be an unachievable or euphemistic goal, several authors have suggested terms such as good enough, appropriate, or least undesirable death. A focus on an acceptable, if not ideal, death may have the advantage of being a less prescriptive, less value-laden, and more realistic framework for end-of-life care. How does work creep into time away from work? It was very interesting to meet two experts in the field of prognosis of survival, Dr. Michael Downing of Victoria Hospice and Dr. Paddy Stone of St.George's in London. Dr. Downing helped create the Palliative Performance Scale (PPS) and is guiding some innovative research on transforming what was initially designed to be a assessment of functional status into a helpful prediction tool for hospice patients. Dr. Stone is heading the large multi-center Prognosis in Palliative care Study (PiPS) study in the UK. We even talked about having an ongoing prognosis conference someday in the future. Ha. Prognosis. Future. It was also nice to meet some international palliativists and realize we all face similar issues. I also met some Pallimed readers. Fancy that! I am very glad for the opportunity to speak at the symposium, meet these fine doctors and continue to work in the future with them, all thanks to the College of Palliative Care and American Academy of Hospice & Palliative Medicine's Year-Long Mentorship Program. The deadline for the application for next year is May 19th! If you are a junior faculty/recent fellow you should really think about it. My offer to mentor still stands, and I am sure Drew would as well. So onto the title of the post..."How does work creep into a time away from work?" Does this happen to anyone else? Everywhere I went during the last two weeks during my trip to Australia, it seemed issues surrounding death, dying and palliative care just crept into my radar, especially while I pursued my entertainment options. Before we left for the trip, my wife gave me a book for the plane. What did she give me? "The Last Lecture" by Randy Pausch, the professor from Carnegie Mellon, living/dying with pancreatic cancer. Even before I left my clinical work, I am reminded about it! It is a great book, and highly recommended as is his lecture on You Tube I previously blogged about. While in Sydney I grabbed a local paper, and find a columnist coming to terms with her mother's death. To learn more about Australia I read Bill Bryson's wonderful travel book "In a Sunburned Country," only to find each chapter has some story about someone dying to reflect on how brutal the wildlife and the environment can be in Australia. Later thinking I would escape all these reminders of work, I pick up Rolling Stone. 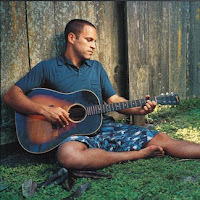 It's got Jack Johnson on the cover, he's mellow, relaxing, easy to listen to. I start reading the article to find out songs on his new album are dedicated to Danny Riley, a nineteen year old friend of the family who lived with Jack Johnson during his final months of life before dying from a brain tumor. So of course I had to listen to his album to actually think about the lyrics in a whole new way. Please do not misread me, I am not upset that I ran into all these reminders of work. I even brought Victor Frankl's Man Search for Meaning on the trip. But I was not really looking for these things, so why did they seem to stand out? Maybe it is a clustering illusion or deformation professionalle? Seriously, if I was an orthopedist would I run into so many stories or reminders of broken bones? Does a cardiologist see heart attack stories everywhere? Do BMW salesman see BMW's everywhere? Does this happen to anyone else? I attended the first two days of the American Pain Society Annual Scientific Meeting in Tampa, Florida. It is a big affair, over 1300 people. I was quite impressed by the quality of the speakers--not just the the content of the presentations, but the speakers were, for the most part, good presenters. The most prevalent recurring theme in the clinically oriented (as opposed to the basic science) presentations was the issue of prescription opioid abuse. It got a bit wearisome after awhile, perhaps because I presented on the same topic at the Nursing SIG session! Kinda reminded me of a recent cautionary comment by Kathy Foley at another meeting that pain management is being eclipsed by risk management. The most controversial session, on the Washington State opioid guidelines (see previous mention), was well managed and avoided descending into a shoving or shouting match. I'm still left unconvinced that the identified problem (an increase in opioid-related deaths in workman's comp patients) will be solved with the institution of the guidelines. They have been identified as a pilot and an educational endeavor, but one person from the audience said that he had been denied insurance payment for a patient on opioid doses greater than 120 mg unless additional justification was provided (perhaps an inevitable and predictable but unintended consequence). The "education" is being provided by the medical director for the department that handles workman's comp. He was obviously well-meaning and very concerned about safety issues, but he is not a pain specialist, and as far as I could tell, had no special training or experience in pain management. The exhibit hall also had it's share of substance abuse-related products and give-aways. There were several urine toxicology companies there and multiple free "risk-reduction" education pieces, all sponsored by pharmaceutical companies. There was an entire session (which I did not attend) on new tamper-resistant formulations of opioids. Other new products and products in clinical trails of interest to this readership: Subcutaneous methylnaltrexone (Relistor) for opioid bowel dysfunction (see previous post); an oral form is just entering phase 2 trials; a pegylated oral form of naloxone is just entering human trials; an oxycodone-morphine combination tablet has just completed its first phase 3 trial; a sustained-release hydrocodone-acetaminophen tablet has completed a phase 3 trial; a cannabinoid is approaching clinical trials. Most of you are probably aware that there are new dosage strengths of OxyContin (15, 30, & 60 mg), and that all of the generic CR oxycodone products are off the market. There are also new dosage strengths of oxymorphone ER (Opana ER; 7.5, 15, & 30 mg). There was a lot of exciting new basic science regarding pathways, receptors, neurotransmitters, and other cool stuff that was mostly over my head, but by implication provided new therapeutic targets. One of the most interesting sessions was on rational approaches to multidrug treatment of neuropathic pain. It's all about patient assessment and pharmacokinetics. On to the nursing (American Society for Pain Management Nursing) pain meeting in the fall! First is a paper discussing a scale developed to measure peaceful acceptance of a cancer diagnosis. This comes from the Coping With Cancer Study (previous publication here) and the paper describes the development and some of the validation of their scale ('PEACE') which attempts to measure both 'peaceful acceptance' of an illness (e.g. asks things like To what extent do you feel you have made peace with your illness?) and 'struggle with an illness' (asks about what extent a patient feels their life is over as they now know it, what extent they feel it's unfair they have cancer, etc.). They also give some of the findings of the CWCS that I'll note. First they found that answers to a single item on the peaceful acceptance subscale (to what extent do you believe a sense of inner peace and harmony?) strongly correlated to the entire peaceful acceptance score (i.e. it could be used as a quick and dirty substitute for it). They also report that patients' self-reported awareness of having a terminal illness (all patients in the study had advanced/incurable cancer) was not related to peaceful acceptance of their illness (peaceful acceptance scores were similar between those who acknowledged or didn't acknowledge being terminally ill). (This is similar to findings they reported in the prior publication I mentioned above.) They did find however that patients' reported 'struggle' with an illness was higher in those with a terminal illness acknowledgment (as were, interestingly, rates of advance care planning & living will completion). As you'd expect, reporting being strongly 'spiritual' had a protective effect all around. Higher symptom scores were associated with lower peaceful acceptance and higher struggle. Of course there's more struggle, but of course there is, and one cannot take away the 'human condition part of the human condition,' so to speak. I think I've blabbed on this blog before that I think the CWCS is one of the most interesting recent research projects out there; it seems to me to be a big leap forward in this type of research (understanding how/why terminally ill patients understand, cope with (or not), their illness and how that affects the sort of care they get) and I hope there will be further publications from the study. Second is a randomized, controlled trial of lamotrigine for chemotherapy associated peripheral neuropathy. It involved 131 patients (mean age 61 years; about 2/3 had finished their chemotherapy) with painful chemotherapy induced peripheral neuropathy with at least 4/10 pain; they were started on lamotrigine (titrated to 150 mg bid over 8 weeks) or matching placebo and were followed for 10 weeks total (only two weeks on the max dose). The results weren't good for lamotrigine: pain was a little better in both groups and both primary and secondary pain outcomes were identical between groups. Lamotrigine had more side effects and more drop outs due to them (this approached but didn't reach statistical significance). A couple things here: people weren't on the maximum dose of lamotrigine that has been studied and shown to be effective (at least 400mg), however there really was not even a hint of a dose response curve here - it's not that lamotrigine looked a little better but didn't achieve statistical significance - lamotrigine's curve never departed from placebo's (actually it looked a little worse for a bit). I don't use lamotrigine and I'm not sure if 2 weeks on the max dose is enough; however the total time on active treatment was 10 weeks without a hint of benefit (and if this drug takes more than 10 weeks to work is this something we'd want to use anway?). This did get me thinking: what are people using out there as the 2nd line antiepileptic adjuvant (after gabapentin or pregabalin which I'm assuming most people are using - one or the other - as their 1st line AED adjuvants)? It also got me thinking: has anything been shown to be an effective therapy for painful CIPN (in a controlled trial)? EPERC recently published this Fast Fact about it and my recollection when I was editing it is that there's a dearth of controlled data. Kendal begins by asking newcomers whether they want to be resuscitated or go to the hospital and under what circumstances. “They give me an amazingly puzzled look, like ‘Why wouldn’t I?’ “ said Brenda Jordan, Kendal’s second nurse practitioner. She replies with CPR survival statistics: A 2002 study, published in the journal Heart, found that fewer than 2 percent of people in their 80s and 90s who had been resuscitated for cardiac arrest at home lived for one month. “They about fall out of their chairs when they find out the extent to which we’ll go to let people choose,” Ms. Jordan said. "Fall out of their chairs...": apparently these patients weren't used to being offered options/choices about their care. Thanks to Kathleen Jacobs, RN for alerting me to this article. The following essay was first published in Prognosis: Contemporary Outcomes of Disease, published by Charles Press, 1981. Permission granted from Dr. Ehrlich to reprint on Pallimed. Prognosis is the essence of Medicine. It gives purpose to diagnosis and helps the physician ascertain what might happen and decide what ought to be done about it. It lends rationale to treatment. All therapeutic decisions, the popular cost-benefit ratio, and various equations that determine choices are based on what we understand about prognosis. It is bewildering, then, that prognosis receives only passing mention in the disease descriptions found in most textbooks and that its study has not yet been dignified by designation as a major scientific discipline. And yet this should come as no surprise. The forbidden kernel in the gift of Prometheus was foreknowledge. Adam and Eve were expelled from Eden because they wanted to know what would happen next. Primitive instinct, which causes animals to respond with fear and flight, detects the danger without understanding it; only Man seeks to scan the future. Prognosis is the forbidden fruit and its pursuit is cloaked in magic. Laocoön perished with his sons in its service, and the gods assured Cassandra's warnings would not be heeded. Logic could infer that it was not too much to expect that the victorious general, Macbeth, would be awarded the traitor's earldom and an elective kingship upon death of the elderly Duncan; voicing the obvious could not come from Banquo or Macduff, however, but had to be pronounced by the three mysterious witches. Three sisters - the magic number: an exclamation point lest one not realize the terror implicit in knowing the future. To learn what would be, Wotan was willing to sacrifice an eye. The malign, one-eyed Hagen was able to capitalize on this distinctive physical similarity to dominate the Nibelungenleid and to become the instrument that determined future events. The pallid Siegfrieds haven't a chance - the present is ephemeral, the future vast. Mephistopheles, Iago, Edmund, and Goneril and Regan - the villains move the piece and fascinate us - their actions become their prognosis. Alfred North Whitehead proclaimed that "It's the business of the future to be dangerous." The more one understands what the future will bring and the more one sees what might be, the more rationally one can behave. Early caveman developed society to aid in withstanding the rigors of existence and he developed agriculture because inclement weather was to be expected. Survival depended on the understanding that putting in stores during the good years and the good days would anticipate the bad. The dream of Joseph saved the peoples of the Mediterranean litttoral. Long before, hunters learned to follow spoor that would lead them to their prey, and the development of this ratiocination determined the optimal place to settle in order to survive. Like Brigham Young, they could say with certainty, "This is the place." The pursuit of knowledge of the future comes dear and the knowledge itself dearer. The man that once did sell the lion's skin/while the beast liv'd was kill'd with hunting him," says Henry V. Croesus sought to know whether he ought to oppose the might of Persia or offer tribute. The Oracle informed him that, if he went to war, he would destroy a mighty empire. Thus emboldened, he fought the Persians, only to see his own empire destroyed. In reading the future, one must be certain not to be misled. Santayana warns that not to know the past is to be condemned to repeat it. I prefer Aubrey Menen's studious locust, as he became enlightened in the irreverent retelling of the Ramayana: "After titanic study he was satisfied that a thorough knowledge of the past could lead a profound scholar to predict the future course of history with great accuracy provided that it does not turn out quite differently." The annals of prognosis are cloaked in mystery and feature a faintly disreputable cast. From the Witch of Endor to Nostradamus, from Heraclitus to Spengler, from Confucius to Malthus, being able to see more clearly assures immortality and hostility in equal measure. Yet the capacity to understand the future helped to create Man. The sibship of the correct prognosticator survived to become our ancestors. It is the knowledge of the future that is powerful medicine and thus it is of the Medicine Man that the tribe stood in awe. Empirical observation produced the skill. But how many pharaohs had to undergo trephining of their skulls because it once relieved the intracranial pressure in one? The responsibility the physician assumes is great. The Ius Talionis saw to it that risks attended the rewards. The physician who cost the patient an eye suffered the loss of his hands. Codified by Hammurabi, the balance implies a sureness, a guarantee, that we have not achieved to this day. Scribonius made the doctor a productive servant of God from whom all healing comes and who imparts to medicines their power. Immortality was longed for, but mortality assumed. Maimonides set the span of life at one hundred and twenty years and argued that it was man who shortened it. How prescient, as Hayflick's cell division gives a figure only slightly lower! Can we determine the factors that shorten life in order to conquer them? Empiricism and the combination of simplistic holisms have given us a start in that direction. But the mischief of irresponsible prognostics is still with us and the task of sorting out only just begun. The modern science of prognosis is based on analysis of groups of people. In most instances, it is not yet possible to extrapolate from the general to the specific in order to arrive at a correct prognosis in a single instance. Obviously it is more important to the patient to know what is going to happen to him than to know that eighty or ninety percent of people like him fare a certain way and the remainder another. Right now prognostication is based on probabilities, but perhaps this book will serve as a start toward a more active search for prognosticators that better characterize the individual. Γνϖδι σαντον, said the Greeks; "Know then thyself and seek not God to scan, the proper study of mankind is Man," echoed Pope. It is the certain knowledge of the future that separates the godhead from Man, and it is the pursuit of that knowledge that ennobles Science. And yet there is just the element of chance that must remain: . . . . "We doctors know a hopeless case if - listen: there's a hell of a good universe next door; let's go!" Over here at Pallimed we’ve been having an off-line conversation about “evidence” for palliative care-related practices, and decided to bring it to our readers. The impetus for the discussion is the publication of two new Cochrane reviews, one on medical hydration in advanced illness and the other on mu-opioid antagonists for opioid-induced bowel dysfunction. Regular readers of Pallimed will know that the three of us are strong proponents of increasing and improving the evidence base for palliative care. We are also very much aware of the difficulty of doing so, especially using the stricter definitions and methods of evidence-based medicine (EBM). I will disclose that I am not a regular devotee of the Cochrane reviews, but “medically assisted hydration” caught my eye. I was disheartened, however to see that only 5 papers made the cut to be reviewed, and that the conclusion was “There are insufficient good quality studies to make any recommendations for practice with regard to the use of medically assisted hydration in palliative care patients.” It reminded me of a conversation a couple of years ago with a well-known pain physician and researcher. He told me that he doesn't even read Cochrane reviews anymore. "They all end with the same conclusion: there is insufficient evidence to make a recommendation about . . . " I don't think that is necessarily a bad thing, but they are super-strict in their criteria for selection. That makes it particularly difficult in palliative care, where doing the type of research one might do for approving a hypertension agent is almost impossible. The issue, of course, is that the assumed “highest” level of evidence is the randomized controlled trial (RCT). Some have argued that RCTs are not only difficult to design and conduct, but may be unethical in interventions for people with advanced disease where comfort, not cure or control, is the therapeutic goal. Others criticize the misuse of EBM, either attempting to apply broadly the results from a trial in a subset if patients, or conversely denying payment for a successful intervention for a specific individual because the RCT “proves” that the intervention doesn’t work. Fragile patients with advanced disease are usually excluded from RCTs, yet that is precisely the population most in need of evidence-based palliative interventions. The phrase “perfect is the enemy of good” springs to mind. But the RCT is unlikely to ever be the “perfect” tool for symptom management, population-based or public health studies, and other complex beyond-the-physiology questions. Carr, an early proponent, points out that EBM continues to evolve, has limits, and can easily be misused. Where applicable, the RCT should be used, but with the results interpreted judiciously for specific populations and individuals. 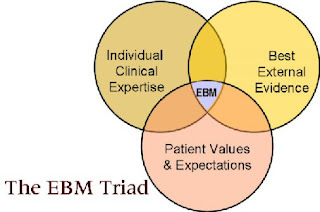 Hallenbeck, Carr (specifically for pain medicine), Aoun & Kristjanson, and Devery are among those who have made reasoned criticisms of EBM, and suggested “other ways” of using EBM or of gaining knowledge. These include an “Equity-based evidence framework” (Aoun & Kristjanson), “narrative-based” evidence (Devery), or recognition that “lower” (not necessarily less rigorous) levels of evidence apply quite well to palliative care. We’d like to hear how our readers use and interpret “evidence” in their practice of palliative care. Hydration: there was only one “high quality” study (2 RCTs) but over a very short duration (2 days) and very underpowered. Overall, results of the 5 studies reviewed were somewhat contradictory, but showed suggestions of improvement in sedation and myoclonus. Negative effects cited were fluid retention leading to peripheral edema, ascites, and pleural effusion. In their conclusion, the authors acknowledge the difficulty of conducting clinical research in the palliative care population. They also comment “the issue of medically assisted hydration in palliative care patients causes such divergent views, yet there are so few studies to guide clinical practice properly. As well as looking at further RCTs in this area, the evidence base will be improved with at least more prospective controlled trials.” It should be noted that the "best" study had quite a few patients with reasonably good performance status, especially in the intervention group. It was not really helpful, therefore, in answering the question: "is medically assisted hydration a helpful intervention in patients in the last days of life?" One of the included studies, a prospective controlled trial, attempted to mimic real world decision-making by allowing physician preference in allocating to the intervention arm. This introduces bias,of course, but downgrading the score on the study design because of it may make some clinicians grind their teeth. The whole point in reading a study is to find help in making real world decisions, isn't it? That raises questions for a future conversation. Naloxone, nalbuphine, methylnaltrexone, and alvimopan were reviewed. There was only one study of nalbuphine. All studies were placebo-controlled RCTs (which makes sense in this case; active-controlled studies would also be welcome). Some studies of the newer agents (methylnaltrexone & alvimopan) were in healthy volunteers. The authors report that their task was made more difficult by use of various opioids in trials, and by inconsistent definitions of postoperative ileus. In general, though, they found (in a limited number of studies with small numbers) that methylnaltrexone and alvimopan were sufficiently safe and effective (increased transit time/decreased constipation) to be labeled “promising.” It should be noted that methylnaltrexone was administered parenterally in these trials, and that oral methylnaltrexone has yet to be reviewed. Alvimopan trials were interrupted because of excess cardiac events. The current target indication for alvimopan (not yet approved) is postoperative ileus. Just as an aside, the last author on this review is Dan Carr, cited above in the EBM discussion. There is another recent review here. A just-published RCT was not part of either review. Subcutaneous methylnaltrexone (Relistor) was approved by the FDA last week for patients in late-stage advanced illness and should be available next month. So, who among our readers is waiting impatiently for methylnaltrexone to become available? Given the route, cost, and limited research, are you eager to give it a try? In general, are we adequately treating opioid-induced constipation, but need this for backup? How will you determine which patients receive it? How many other interventions do you need to go through before you determine that constipation is refractory to more conventional treatment? Oh, and do any of you actually use the newly minted term 'opioid bowel dysfunction' (OBD)? The Comments link awaits you.